Michele Lang writes paranormal tales set in contemporary and futuristic places: the stories of witches, lawyers, goddesses, cops, bankers, demons, and other magical creatures hidden in plain sight. She is a graduate of Harvard Law School, and in addition to writing fiction, Michele has practiced the unholy craft of litigation in both Connecticut and New York. She lives and works in a house by the sea near New York City. Here’s Michele Lang’s website. 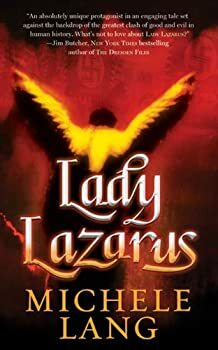 Lady Lazarus by Michele Lang is a historical fantasy set just before the beginning of World War II, in a slightly skewed version of our world. What makes it skewed is that in this alternate history, magic exists and plays a major role in world events. For example, Hitler’s werewolves are literal here. Magda Lazarus has killed Adolf Hitler’s pet wizard, the Staff, but not before the Staff stole a fragment of the powerful Book of Raziel and used magic to reconstitute a corrupted version that is now in the hands of the Reich. 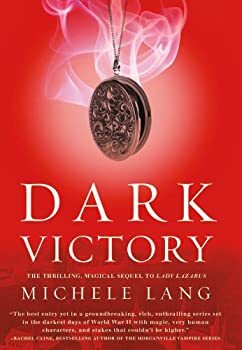 Dark Victory begins as the invasion of Poland is imminent, and Magda is trying to decide on her next course of action. Sacred Circle — (2006-2011) Publisher: She’s running out of time… can Gwen stop an ancient curse from destroying Camelot and New York City? Gwen Dulak, high-powered Manhattan attorney, is running out of time — literally. Time to thwart an ancient curse, repair a legendary wrong and prevent an unthinkable future. Netherwood — (2008) Publisher: NETHERWOOD tells the story of Talia Fortune, an intergalactic sheriff who hunts and falls for a cyber outlaw in an offworld, sentient Sherwood. I think of NETHERWOOD as a futuristic Robin Hood story. Talia Fortune has a lot to prove — she is the chief shareholder of world corporation FortuneCorp and has lived in the shadow of the company’s founder, Violet Fortune, all her life. She’s come to the planet of Fresh Havens to make her name and cover herself in glory. Unfortunately, Fresh Havens is no paradise — it’s more like a carnivorous plant hungry for its next human sacrifice. She finds an outpost of human rebels hiding in the Gray Forest, a dark and primeval jungle filled with sentient swarms of bugs and wracked by magnetic storms. Talia’s hunting a cyber outlaw named Kovner, aka The Avenger. And what she discovers when she finds him destroys her world and everything she thought she knew about herself. The Walled Garden — (2011) Publisher: A young woman with a turbulent past discovers a secret world under New York City in the 1980s. Here there be magic, and monsters… After surviving a brutal attack at college, Mireya Rodriguez must choose whether she will live her life, or simply survive. A seemingly chance encounter with a man named Jonathan Mellon leads to magic, romance, and danger in a secret world hidden under the streets of NYC. This is an expanded version of the story that originally appeared in The Mammoth Book of Time Travel Romance, also available as a collection from Amazon. Fade Away and Radiate — (2013) Publisher: No safe place… Acclaimed terraformer Anika Bowman runs from her husband’s killers to a remote, uninhabited planet. But then Captain Billy Murphy, the last man to see her husband alive, crash lands on her faraway haven and destroys her illusions of safety. Captain Billy Murphy knows who killed her husband. He wants to save Anika if he can, but first she has to let go of the past… This novelette first appeared in the Mammoth Book of Futuristic Romance, and is paired here with a bonus story — “The Triumph of Arachne,” first published in the June 2012 issue of Penumbra Magazine. CLICK HERE FOR MORE SPECULATIVE FICTION BY MICHELE LANG.